Biology.ie is an online personal biodiversity monitoring resource that was established in 2005 by naturalist Paul Whelan. The site lets you keep track of your personal wildlife sightings, and is a bit like an online field notebook with built in mapping and species lists that helps you to monitor what you see, when and where. 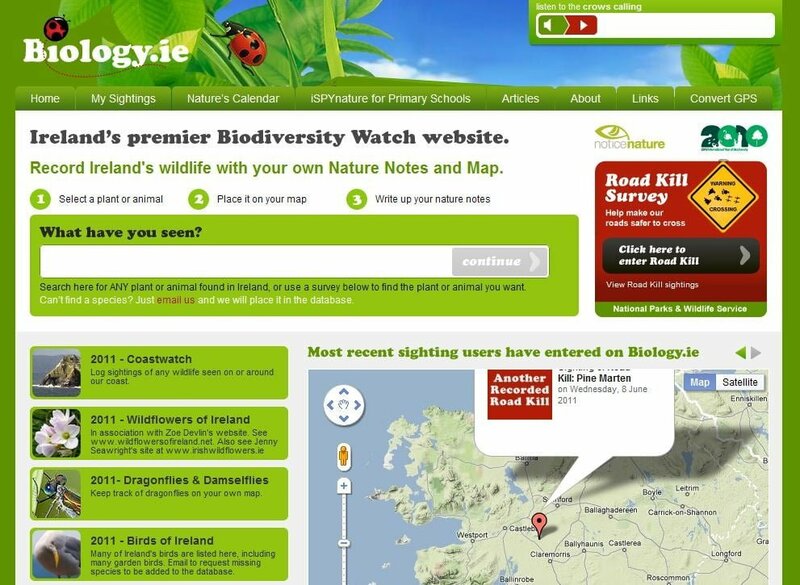 The primary aim of Biology.ie is to increase biodiversity awareness by allowing users keep an online map and nature notes. This is found under the My sightings menu. Regular use allows a user to build up an informative wildlife map of their areas of interest. Nobody else can see these maps or nature notes. Over time the site can help you identify trends in the wildlife you see, build a detailed map of what you see where in your local area, and allow you to look back over your nature notes and sightings details, letting you compare differences from year-to-year and season-to-season. Another boon of the site is that by submitting sightings you not only keep track of the wildlife you see on a personal level, you also become a “citizen scientist by proxy”, contributing biodiversity data to a variety of survey projects run by organisations that support Biology.ie (organisations like the National Parks and Wildlife Service and the National Biodiversity Data Centre for example). If keeping an online record of your wildlife sightings is something that appeals to you, biology.ie is well worth a look.